a touch of decoration, in the form of brass rivets set along its edges. Traditionally, the manifer (bridle-hand tilting glove)was worn on the left hand, and was favored by knights on horseback as the hand that held the reigns of their warhorse. In this model, though, it is fairly universal in design, in that it can easily fit the left or the right hand, to suit the wearers need. This manifer is made entirely from 18 gauge mild steel and features a slight hinged joint at the wrist to help offer a bit of mobility, while its solid plate design ensures that, left or right, the arm that wears this protection is sure to be safe in combat. The manifer and its overall design are further accented by a touch of decoration, in the form of brass rivets set along its edges. The manifer is sold as a single piece. 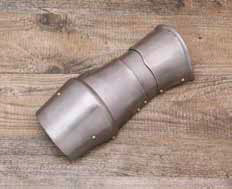 The 18 gauge construction makes it perfect for costume wear, as well as for use in light reenactment, stage productions, and of course, LARP events. Jousting emerged in the High Middle Ages based on the military use of the lance by heavy cavalry. It transformed into a specialised sport during the Late Middle Ages, and remained popular with the nobility both in England and Germany throughout the whole of the 16th century (while in France, it was discontinued after the death of king Henry II in an accident in 1559). In England, jousting was the highlight of the Accession Day tilts of Elizabeth I and James I, and also was part of the festivities at the marriage of Charles I. This page was last modified on 4 May 2014, at 17:04.